What should I name our cookbook? After all of your good feedback on what I should write next...I decided to do something entirely different. My father's been telling me for years that I need to compile our recipes into an in-season, homegrown cookbook, and I've been ignoring him...but the time finally seemed right! Which means, you'll soon have several polished recipes in ebook form to enjoy in the near future. And, in the meantime, I'm in search of the perfect title. Titles are my weak point, but they seem to make or break a non-fiction book. I could go with a boring, literal (but likely to capture keyword searchers) title like Locavore's Cookbook or In Season Cookbook. I could piggy-back on possible name-brand recognition with The Walden Effect Table or (if my publisher says it's okay) The Weekend Homesteader's Kitchen. Or I could go with something entirely outside-the-box...which I haven't come up with yet. Feel free to submit your title suggestions using the comment form below. To sweeten the pot (and to continue cleaning out my bookshelves), if I choose your title, I'll mail you slightly used paperback copies of Moosewood Cookbook, Preserving Food Without Freezing or Canning, and Wild Fermentation. I'm looking forward to hearing from you! Also, I am loving reading about your work throughout the winter. It is keeping me motivated to fight this yucky weather and get stuff done. Thank you! How about "Cook Like You Actually Care"
I actually really like The Weekend Homesteader's Kitchen - I feel like it hits all the points really succinctly. In Season: Grow it, Cook it, Eat it. Love your site. Spice Your Life with Seasonal Cooking. Eating Through the Seasons; with snapshots of recipes. Our Kitchen, through the Seasons. A Year in the Walden Kitchen: Seasonal Cooking. I had to modify some of my first ideas, as they had already been used by someone else. I've tried your recipe's....I know they are good. Looking forward to the book. Maybe something to suggest a companion volume to "Cooking the Working Chicken," like "Cooking the Working Tomato," or something. Or "Cooking with the Walden Effect,"
or something more grandiose like "Culinary Delights of the Walden Effect." You had me with your cookbook bribes. How about the The Walden Effect Kitchen or Cooking with the Walden Effect? I was thinking of "DINNERS Made from the HOMESTEAD GARDEN" or "HOMESTEAD MEALS from the GARDEN". I think Yamila is on to something, because as locavores know, eating locally is all dependent on what grows nearby. "The Virginia Homestead Cookbook" does make it clear that your recipes are developed by what we grow here. It might limit your mass appeal to other US regions or internationally, or it could prove to become am invaluable resource to the population centers here in the Mid-Atlantic. I bet they would carry it at the Monticello bookstore too! I suggested Virginia in the title because I'm from the deserts of the southwest and Virginia makes me think of...um...dirt. Good dirt. Loaded with nutrients. Earth worms. Dirt you could put on a plate and eat practically. Not this desert scrub brush crap all around me. Mentioning Virginia makes me think of 'earthy food.' I think exploiting your novelty location would help a cookbook. I wouldn't want to read a cookbook from Maine, Vermont, New York (would be to snooty), and what the heck has Delaware got going for it? But Virginia? Probably some good earthy food coming out of there. Feasting on Life: A Homesteader's Collectibles (or Journey). Imagine calling a farm "feasting on life farm"?! LOL! Month-By-Month Meals: How to cook delicious food using in-season, local ingredients. 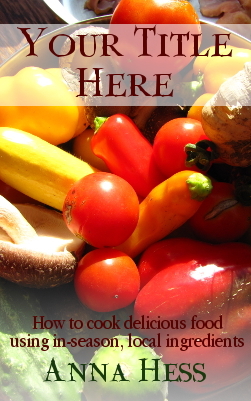 The EveryMeal Cookbook: How to cook delicious food using in-season, local ingredients. Eating the Trailerstead: Cooking local in-season meals with Anna Hess. Here for Dinner: Cooking local in-season meals with Anna Hess. David --- A slight variation of your title (Farmstead Table) appears to be the winner! If you're still reading, drop me an email at anna@kitenet.net with your mailing address and I'll get your books to you ASAP. Thanks to everyone for such excellent suggestions! It was hard to narrow them down to a single winner!